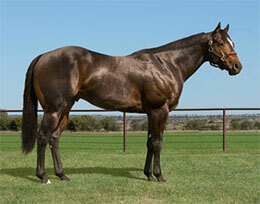 Fantastic Corona, Jr. sired his JRS Blue Boy, winner of the recent $33,410 Intermountain Futurity. WAYNE, OK�SEPTEMBER 16, 2015�FANTASTIC CORONA JR got his first stakes winner on September 7 when JRS Blue Boy won the $33,410 Intermountain Futurity. JRS Blue Boy is a homebred racing for Sam Allie of Glasgow, Montana. The gelding is out of the Dash Ta Fame mare Lil Blue Blitz, and is now 3-for-3 in his career with $16,964 in earnings. From two crops to race, Fantastic Corona Jr has sired 29 winners and 36 ROM from only 50 starters. They have progeny earnings of more than $328,000. Among them are Grade 1 finalist Phenomenal Jess ($56,023). FANTASTIC CORONA JR won seven of 17 starts, with four seconds and three thirds, and career earnings of $541,896. He ran second in the Grade 1 Los Alamitos Winter and All American derbies, and third in the Grade 1 Los Alamitos Two Million Futurity and Southern California Derby. He was also a finalist in the Grade 1 Ed Burke Million Futurity, Los Alamitos Super Derby and 2010 Vessels Maturity. The 9-year-old son of leading sire Corona Cartel is out of the Strawfly Special mare Special Queen SA. He is owned in a partnership of his late breeder, Gianni Franco Samaja, with John Andreini and Vince Genco. Corona Cartel is the sport�s leading living sire, as well as a leading sire-of-sires. FANTASTIC CORONA JR�s dam was a Grade 1-placed runner and half sister to champion and leading first crop sire Good Reason SA, sire of 2015 All American Futurity (G1) winner Jess Good Candy.